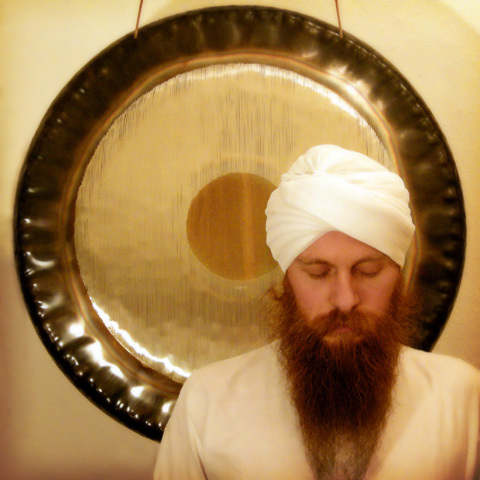 Educator and musician Johannes Heimrath conducted many workshops and healing sessions with the gong in the 1980s. He discovered that the sound of the gong was most helpful in connection with relieving neck pain and headaches, menstrual difficulties and cramping in the chest and upper respiratory system. The gong also works deeply on the mental, emotional and spiritual bodies. The gong purifies and quietens the mind. It literally cuts through the linear mind and clears the clutter from the subconscious mind to reveal the radiant and authentic self. It has the capacity to bring us to our neutral mind that is wise and non-judgemental. It helps turn the mind to zero, a state of stillness where innate wisdom can be accessed. What happens in a gong healing session? A group session is a good way to experience the healing power of the gong. In a session with Angad expect to chant a few mantras, stretch a little to open the body and then to lie down and relax whilst the gong is played. The gong is used to balance the group and depending on the size of the group may focus on individuals within the group if appropriate. The key difference in a 1-2-1 session is that the gong sound and intention is personalised to to the individual and their specific needs. The gong can be played for physical relief, emotional release and balance or to help spiritual growth. A session would include a short interview to understand the needs and focus for the session, a gong bath/meditation followed by time to relax. Sessions are currently available in the West Midland or London via appointment.